Happy Feis Ile 2017 everybody! Time to get back to the tradition of reviewing a whisky from the corresponding distillery that holds an open day (after a break last year) and we starts with Lagavulin that holds today their open day (and with a new sparkling Lagavulin 16yo double matured in Muscatel wine casks). 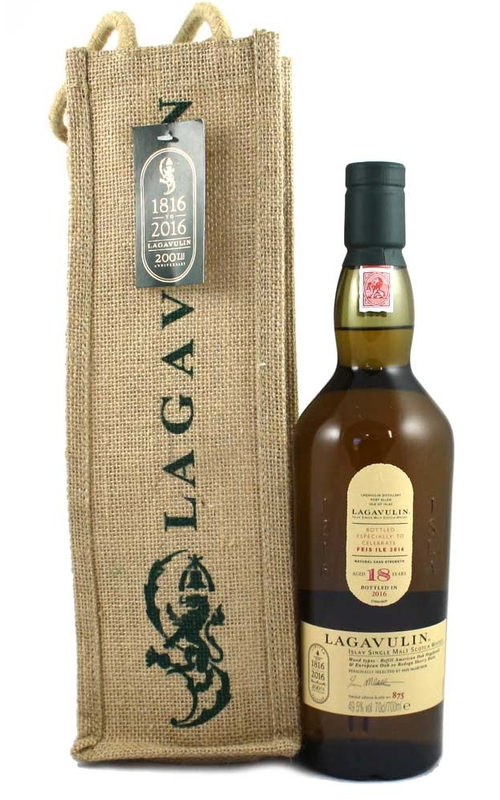 I didn’t need much time to ponder on the whisy to review today and went with the classic choice – the Festival bottling from last year when Lagavulin had their 200th anniversary. An 18 years old Lagavulin from European oak ex-bodega Sherry butts and refill American oak hogsheads. Nose: A mellowed nose without a big hit of peat. Slowly a mixture of peat and dried red berries (raspberries mostly) rises up to the front and it’s quite balanced between the old peat and the berries. Even after a few minutes in the glass it remains a very restrained nose but now there are passing-by notes of sour sweet old sherry with a dash of sherry vinegar and then some cinnamon and spearmint like sharpness. Palate: Gentle and mellow peat, sweet dried fruit, raspberries, soot, very rich and chewy feeling with ashes in the end. Finish: Medium-long length, earthy peat and smoke, dryness, and lingering sweet dried fruit. Thoughts: As usual, an excellent offering from Lagavulin for last years’ festival. Mellower and more restrained than I expected and the lower ABV may have helped here, but it just means you can drink more in one sitting. That is if you have a bottle. Slainte and happy Lagavulin day! This entry was posted in Whisky Reviews and tagged Lagavulin on May 27, 2017 by Yoav @ Whisky Gospel.